The following article was prepared in collaboration with our affiliate, Wipfli LLP. With more than 2,000 associates across the United States and in India, Wipfli ranks among the top accounting and business consulting firms in the nation. Many business owners feel the stresses inherent in executing the day-to-day activities necessary to keep their company moving in the right direction. In the same breath, it’s not uncommon that they also rely on their business to be the golden goose that can fund their retirement when the time comes. 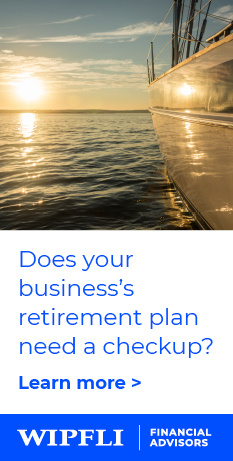 Yet all too often, a common challenge presents itself: business owners do not have formal business and retirement plans in place that link where they currently are, where they want to be and how they will get there. By having a formal strategic business plan, transition plan and retirement plan that are all organized, communicated, reviewed and, most importantly, coordinated, you can help take chance and luck out of the equation and focus on a targeted road to success. Being a business owner means wearing a lot of different hats and successfully carrying out numerous responsibilities. However, stepping back to pause and reflect on where the business is headed is an often overlooked necessity. This action, which requires honesty and objectivity, brings about clarity. It should answer whether your business is going to maintain its current state or set the course for a growth trajectory. Along with outlining the future you see for your business, you should also pause to visualize what you want your retirement scenario to look like. Having a concrete vision for your business and personal retirement provides the necessary foundations for formal strategic business planning, transition planning and personal retirement planning. No one goes through the work, risk and sacrifice of starting a business without wanting it to succeed. Yet strategic planning, which centers on setting your business goals over the medium term and formalizes the direction of the business, is a process commonly neglected by owners — often to the detriment of their business’ profits and long-term goals. Think of the strategic plan as an itinerary for a vacation. It organizes specific destinations with predetermined arrival times for each and leads the traveler to their final vacation destination. Business plans, which outline the business’ tactical actions over the next 12-36 months, should harmonize with the destinations on the strategic plan’s itinerary. As the business’s owner, you should drive the strategic plan initiative but also understand that obtaining multiple viewpoints — internal and external — can produce better results. Because a strategic plan challenges the status quo, you must be prepared for bumps along the journey. It’s equally important to measure and monitor the progress of the strategic plan. You may need to take a different approach based on the goals outlined — remembering to be proud of the business’ strategic plan, communicate the objectives and progress so that everyone within your organization can see they have a specific role in getting the business to its destination. Once the vision for your business is clear and you’ve implemented its strategic plan, you also need to incorporate a business transition plan. Business transition planning involves both long-term and short-term strategies that allow a business to viably transfer at an appropriate price and time in the future. These plans also help identify and develop talent while protecting against an unforeseen event such as death, disability or incapacitation. The first objective of transition planning is for a business owner to identify the skills and talents of their current workforce and assess if they have the right people to assume key positions should the need arise. Specific training and development for key employees should be implemented so that the business will smoothly transition and continue to operate. The second objective of transition planning focuses on owners building a transferable business. A transferable business is one that can be owned and operated by someone other than its current owner. The acronym GROW outlines the specific characteristics that investors find attractive and are willing to pay for. G – Growth: Demonstrate that your business is growing and has a process for continuing to do so. R – Risks: Firms that understand their risk characteristics and strive to make themselves less risky are inherently more valuable than their competitors. For instance, a fabricator could enjoy growing revenue and shrinking expenses as the company employs process improvements and better serves its key customers. But if those few key customers all come from one area of the economy — and, even worse, make up the majority of the fabricator’s revenue — the business could be viewed as a high-risk investment. O – Organization: This includes the people and culture that have allowed the company to succeed and will carry on into the future. A business that lacks the ability to find, retain and motivate employees over the long-term is doomed. One that can consistently do so is constantly building value for its owners, regardless of who they are. W – Wealth Generation: Businesses that consistently understand their cashflow-generating ability and work to increase it are those that build wealth for their owners. Owning a business is capital intensive, especially in the early phases of the journey when personal assets are used to fund the business, as financing may be difficult or impossible to acquire. Practically, this means that business owners find themselves not only with a shortened window of time to set aside finances but also without the normal avenues of saving for retirement such as a company-sponsored pension plan. For business owners, the burden of saving for retirement lies solely on their shoulders. When the business produces sufficient free cashflow, an owner should take the opportunity to enact a financial plan to achieve their retirement goals. A refrain we often hear from business owners is that they feel their own business offers them superior returns. Though this may be true, we always remind them that owning a business is like owning a large, concentrated, illiquid investment with key person risk. Though the returns may be superior, the risk may not be worth it. To the extent possible, a business owner should take steps to separate their retirement funds from their business. By creating wealth outside of the business, you will be able to make more objective decisions regarding the strategic positioning of your firm. 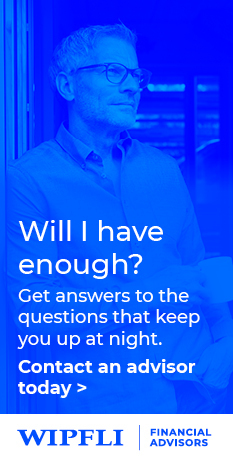 A financial advisor or retirement plan specialist can add value for business owners in many ways: by helping select an appropriate retirement savings vehicle for the business, determining target savings amounts needed to fund specific personal financial and retirement goals, efficiently managing a diversified investment portfolio, performing strategic rebalancing, and incorporating tax efficiencies where there are opportunities. When done well, retirement planning for a business owner provides a margin of safety whereby the transition or sale of the business does not have to be relied upon as the sole source of funding a successful retirement. With a clear vision and intentional planning, business owners can build their business to have transferable value as well as position themselves for financial and retirement success. Contact an advisor to start the conversation!